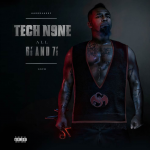 As the day tens of thousands of Technicians have been patiently waiting for has finally arrived, Tech N9ne’s latest album, All 6’s and 7’s, is being praised by the top media outlets in the hip hop industry. Not only does the King of Darkness bring a whole new list of guests to the table, but his name is popping up all over iTunes charts, radio and even television. DJBooth.net released its own review of All 6’s and 7’s this morning to voice an opinion on the 24-track album. From giving a background of Tech N9ne to talking about the collaboration with Lil’ Wayne, DJBooth gives a great insight on what you can expect from the album. Be sure to leave a comment and let all of the non-Technicians out there know who is running the rap game! Have you ordered your copy of All 6’s and 7’s yet? If not, click here to purchase on iTunes or pick it up in stores like Walmart and Best Buy. Also, be sure to follow Tech N9ne on his official Twitter page. What did you think of this article? Is it accurate? What’s your favorite part about All 6’s and 7’s? Let us know in the comment section below!